If anyone OUT THERE has some tips for me on photographing my cards I would greatly appreciate the help. My cards generally look "crooked" and the glitter is usually not visible. Also, I get a big "shine" effect from the flash....suggestions...anyone? anyone? I also wanted to tell you how excited I am to be able to display the Jill Foster Inspired by blog blinkie.....I don't have many blinkies and this one really makes me happy ;-D If you have never been to Jill's blog I really urge you to stop by....you won't be disappointed! Well I, for one, love your blue flowers so don't stop :) Your cards are usually so cheery , bright and fun- just love 'em!! 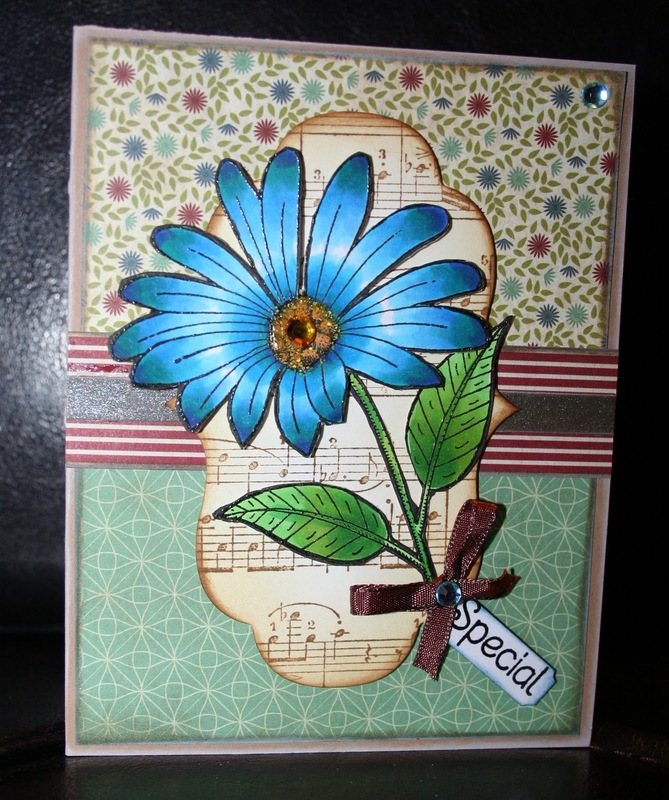 This one's a beauty too with all that fab pp and musical die cut! As for the photography- I struggle with that too, but one thing I would say is that maybe using a black, or dark bg might make the glare from a flash seem brighter?? Are you taking the photo during day or evening? Around a window to help capture good light? I try to take most of my photos (not that mine are so good) during the early morning when sun is brightest and by a window so I can take advantage of as much light as possible. Good luck :) Hope this helps! I'm just fine with your blue flowers - keep 'em coming! Sheila I never tire seeing all the fabulous ways you use this stamp. Each and every design has a new twist which makes this image new and fresh all over again! Sheila - I ADORE your blue flowers and in the end, if they make YOU happy, then keep 'em comin!! Lin turned me on to Picassa and I LOVE it! A few suggestions - use a white, light blue, or light grey background. DO NOT USE FLASH! On your camera - turn the flash setting off. You can see the reflection on your photo. The straighten setting on Picassa is AWESOME! If you have a macro setting on your camera, use it. It will bring your card close-up to the camera. When you use natural light, you'll see a huge difference! I think I NEED this flower stamp Sheila. It is beautiful and you colour it beautifully. I used Picnik in Flickr to adjust my cards. I try to ensure I take daylight photos - I have a kitchen bay window I use. Picnik allows me to straighten a bit. Good luck with your photography.